August | 2018 | Bluffton Lodge #145 F.&A.M. Yet again we find ourselves emerging from the from the wonderfully spent months of summer into the fall season. The kids and grand kids are back to school, the hallowed lights glow on Friday evenings in the longstanding tradition of Friday night High School Football games, and we once again dust of our suits and aprons to join our Brothers back at Lodge on the first Tuesday of the month. The Worshipful Master and Officers would like to invite everyone back on September 4th for dinner at 630 pm and Stated Meeting at 730. The Summer/Fall Silent auction is being held in the Dining Hall, and there is a great selection of items that have been donated by Brothers for you to bid on. Due to multitude of donations over the Summer the bidding will continue into the Fall with an final bid date to be announced at a later date. Three of our very own Brothers have been selected by The Grand Lodge of Indiana to aid in two vital information and instructional programs. 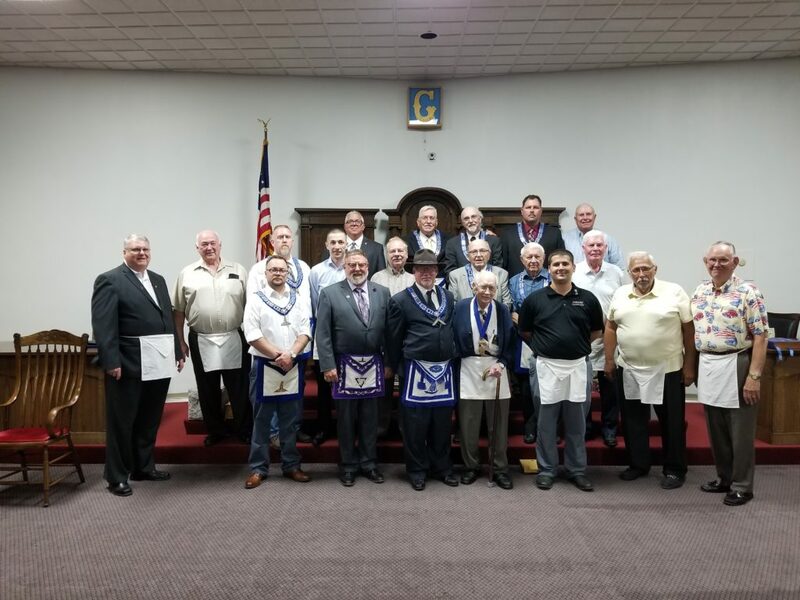 Brothers Fred Lucabaugh and Jan Henline will be Ritualist Instructors for District 1 and 4 and Brother Nate Moyer will be the part of the Masonic Education and Traveler’s Journey Program as the Coordinator for District 4. Please wish them well on their Masonic travels and keep up with them as there will be opportunities to travel to other Lodges in the area. As Fall is upon us the Lodge again opens its doors wide for its Brothers. We will have a busy Stated Meeting in September, so if there are any topics that you would like to see on the agenda please email the Secretary so that we can add them to the agenda and address topics in a expeditious fashion. Additions and comments are earnestly welcomed at the meeting, but we are trying different ideas and approaches to help make our Stated Meetings more time conscious for our brother and allow more time to socialize. Due to a large number of additional items in the Silent Auction we will extend the bidding and announce a date to end bidding at a later date. Please take a moment to visit the tables in the Dining Hall downstairs and see the amazing items that are up for auction. As we move forward further into the Fall and into Winter please keep in mind that we several important events. We will be announcing dates for degree work, Lodge of Instruction, as well as a Breakfast With Santa in December! Also we will be having our customary Secretary’s Fish Fry in October and Officer Elections in November at our Stated Meetings. See you in September for an exciting Fall in Indiana Freemasonry and at Bluffton Lodge 145!